All Rail Passes are currently unavailable for sale. They may be returning for the 2019/2020 season. If you‘re not sure when you’d like to travel, the Freedom Pass is for you. A Scenic Rail Freedom Pass is a flexible ‘Book As You Go’ travel pass that allows you to travel on New Zealand’s 3 long distance passenger train services between Auckland and Wellington, Picton to Christchurch, Christchurch to Greymouth and ferry sailing/s between the North and South Islands by purchasing the number of ‘Travel’ days you want to use and travel whenever it suits, for up to 12 months from the date of purchase. Passes can be booked up to 12 months in advance and are valid for 12 months from date of first travel. 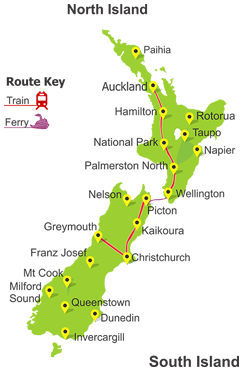 Scenic Rail Freedom Pass is ideal for 1 week to 12 month stay in New Zealand.Scenic Rail Freedom Pass is suited for the independent traveller, families or small groups, who are travelling together on the same routes, to the same destinations. Reservations for train service should be made at least 24 Hours prior to travel date to secure you a seat on the train. Reservations are subject to availability and can be made by contacting our New Zealand Travel Team. Choose a fixed term pass for 7, 14 or 21 days and get unlimited travel on all 3 long distance scenic train services, as well as the Interislander ferry. This is perfect if you want to explore over 1-3 weeks, and want to be able to use the train on any of these days. Fixed term pass travel days commence from the start date specified when purchasing, and you can book your trips via email or by phoning us. To ensure there’s a seat for you, you’ll need to book 24 hours prior to travelling. All Rail Passes are currently unavailable for sale . They may be returning for sale for the 2019/2020 season. Choose a fixed term pass for 7, 14 or 21 days and get unlimited travel on long distance scenic train services. This is perfect if you want to explore over 1-3 weeks, and want to be able to use the train on any of these days. Fixed term pass travel days commence from the start date specified when purchasing, and you can book your trips via email or by phoning us. To ensure there’s a seat for you, you’ll need to book 24 hours prior to travelling.